Thanks to Jerry S. for the reminder about E.B. White's birthday July 11th! From Jerry: Let us honor E. B. White, born on July 11th, 1899. When White died in 1985, William Shawn, editor of The New Yorker, wrote, "He never wrote a mean or careless sentence." And, of course, White had dachshunds. 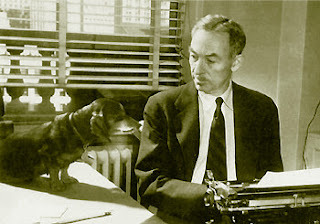 This is a picture of him and Minnie in white's office at the New Yorker. It was White who wrote, "I would rather train a striped zebra to balance an Indian club on his nose than induce a dachshund to heed my slightest command." Speaking of his boy Fred, he said, "I've never had a dog who understood so much of what I said or held it in such deep contempt." Find out more about E.B. White at wikipedia.